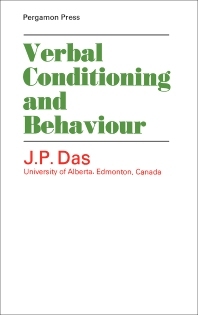 Verbal Conditioning and Behavior clarifies certain major issues in the area of verbal behavior, with emphasis on the problems that are continuous and those that are discontinuous with animal learning research. This book provides information pertinent to certain areas of complex verbal behavior. Organized into 10 chapters, this book begins with an overview of conditioning as an objective tool for the investigation of verbal behavior. This text then explains the relationship between the extent of verbal intervention and the degree of closeness of the conditioning task to a task of concept-learning. Other chapters consider the role of reinforcement in human learning needs. This book discusses as well how meaning is acquired and how it can be transferred once acquired. The final chapter deals with the individual differences in the development of a certain conditioned response. This book is a valuable resource for psychologists, college students, teachers, and researcher workers.